I have never taken any of the animals I’ve hunted to a butcher. 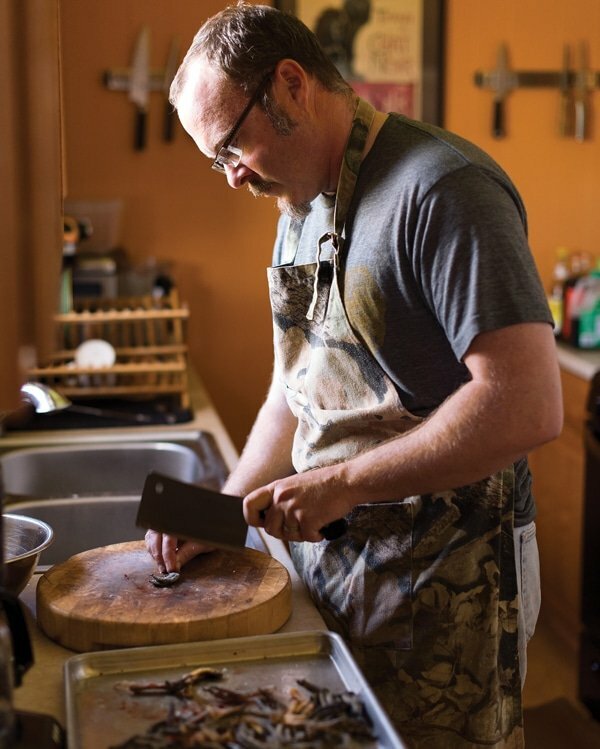 I’m not sure why, but it’s probably because a) one of the skills I learned as a cook in restaurants years ago was breaking down whole animals, mostly lamb; and b) the first guy I ever hunted deer with was my friend Tim Huber, and he wouldn’t think twice about butchering his own deer, even in a hotel room. And yes, we did indeed do that once in Choteau, Montana (and yes, we cleaned up afterwards). Butchering to me is therapeutic, which could sound weird to people who’ve never done it. But breaking down animals I’ve hunted is, to me, like opening a Christmas present. Each cut gets me thinking about what sort of meal I might make with it. Roasts, steaks, shanks, even the trim and stew meat and offal. My knives become an extension of my hand, quick as lightning. 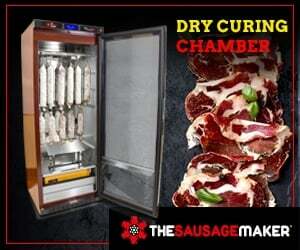 And at the end of it all comes time for sausage and salami, an equally satisfying process. I get asked a lot about the equipment I use for all this. Well, here’s what I’ve learned over the years. Keep in mind that this is what works for me. I’d love to hear what other stuff you love to use, as I know there are some other great home (and professional) butchers out there. I’m not going to go into guns and ammo here, but for the record I shoot a Remington 700 in .270 and run Nosler trophy grade copper ammo through it. OK, you have a deer or pig or whatever on the ground: Now what? I really like a good knife with a gut hook to get things going. Not strictly necessary, but I like the way a gut hook unzips a paunch quickly. For this I use an Outdoor Edge utility knife set. I like that it has a nice big knife, a skinning knife (which dulls fast, though) and a bone saw included. A better skinning knife is, however, the Havalon — this is the scalpel knife with disposable blades. Best skinning knife ever. Only thing you need to be careful about is understanding how sharp this thing really is. I’ve cut myself twice with a Havalon and barely knew it, once all the way to my knuckle. But I’d allowed myself to get distracted when that happened. Keep your eye on the ball and you’ll be amazed how easily things go with this knife. I rarely use gambrels but they can be handy if you have big trees around. I typically skin one side of an animal, then flip it using the skin as a mat for the other side. Works fine and is great in grasslands, where there are no trees. But lots of people prefer to hoist an animal up on gambrels. You’ll also want to pack in a game bag. The kind I just linked to is the one I like: It’s real cheesecloth, not the cheap stuff that lets flies in. Regular sealable plastic bags are handy for the heart, liver and kidneys. Zip ties are a good idea for attaching your tag, although leftover twist ties from a loaf of bread work well, too. Once you get home, you need an area to work in. I use my little galley kitchen — 67 square feet including the counters — but then Holly is also a hunter so we’re cool with that. I know lots of people who set up stations in their garage, complete with stainless steel tables and special sinks. That’d be awesome, but in our deer seasons my garage can often be 90°F, which is not ideal for game processing. So for me, the kitchen is better. You’ll want lots of cheap kitchen towels and large plastic tubs, both of which are available at your local supermarket. Have several rolls of paper towels around, too. If you haven’t already, you need to quarter your critter. I use a pair of boning knives for most of this work as well as the fine work that follows. My go-to is an ancient stiff-bladed Old Hickory boning knife I got from my friend Elise. I’ve also used this J.A. Henckels boning knife and it’s pretty close. I like the stiff blade for most uses because it feels more substantial somehow. That said, I switch to a flexible boning knife when I remove the backstraps and slice off silverskin. 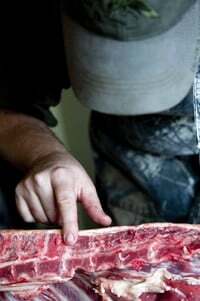 The reason is because the bend in the blade really helps you extract as much meat — or save as much in the case of silverskin removal — as possible. Flex blades tend to be thinner, too, which helps a lot. My flex blade knife of choice is the Global 6 1/4 inch flexible boning knife. I’ve been using one for many years and I find its thin blade to be perfect for fine work. The Global edge really holds, too, unlike my ancient, stiff-bladed knife, which needs to be resharpened often. I can do almost all my butchery with just those two knives, plus my regular chef’s knife. The only other tool I need is a saw of some sort. I used to use a regular hacksaw, but I’ve graduated to a proper DEWALT cordless sawzall. I use the saw only for ribs and shanks. Everything else I can do with a knife. Keep in mind I don’t cut chops, so I don’t need the saw for that. I typically keep the broken down deer or pig or whatever in the fridge for several days before I freeze it. I find this lets the meat relax and results in more tender venison or pork down the road. It also gives me time to make burger and sausage, which I’ll get to in the next section. But when it’s time to freeze things, there is only one way to go: Vacuum sealing. I’ve used both chamber sealers and suction-style sealers. If you really want to spring for a serious set-up, a chamber sealer is the way to go. I must admit I don’t own one, as good ones cost at least $1000. But I’ve used them many times, and it rocks. Professional grade, the bags are cheap and the seal is stronger than anything else you can buy. A cheaper option that is almost as good is either the Weston 1100 sealer or the FoodSaver Gamesaver. They’re still about $400, but should last you many years. I have the older version of the FoodSaver vacuum sealer and have pounded on it for several years with no complaints. And by “pounding on it” I mean hundreds of game birds and fish, plus a few wild pigs and deer. Can you get cheaper vacuum sealers? Yep. But you get what you pay for. Bad seals, overheating motors. This is an area you don’t what to be skimpy on. As for a freezer, buy a chest freezer. Period. You’ll need it if you are a deer hunter. Chest freezers can be stored out of the way and they will get a lot colder than your kitchen freezer. And they’re not terribly expensive. I just bought a 7-cubic-foot freezer from Home Depot for $235. I am not going to get into dry-curing salami in this section, as that’s an advanced discussion. But this is the basic equipment you need for making your own burger, fresh sausage and jerky. First you need a good grinder. If you are just starting out and happen to have a Kitchenaid stand mixer, the KitchenAid grinder attachment works fine for small batches; it’s what I used for years. But if you process more than, say, a deer a year, you really ought to spring for a good grinder. My favorites are the Weston No. 8 grinder. and the various commercial grade grinders from The Sausage Maker. These grinders make quick work of anything you can stuff into it. My absolute favorite part of these grinders is the fact that you can buy all sorts of different dies for them, so you can grind as fine as 3.5 mm, which is almost an emulsified sausage, all the way to 12 mm, which great for that first grind in sausage-making. As for a sausage stuffer, you can’t go wrong with The Sausage Maker’s 5-pound stuffer. If you plan on linking your sausages, you really, really need a dedicated stuffer — running ground meat through the auger of your grinder can destroy its texture. 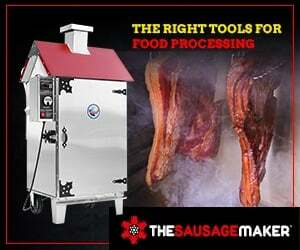 Other sausage-making equipment you’ll want will be natural hog casings, curing salts and some sort of rack to hang the links.The Sausage Maker does excellent mail order for these items. As for jerky, I am not a fan of “jerky guns,” so I cut my own meat by hand and dehydrate it. My dehydrator of choice? The Excalibur 9-tray dehydrator, which will handle anything you can throw at it. Phew! A lot to cover. But that should get you started. My advice? Build up your collection of this stuff over time, as some of it can be expensive. Start with a good boning knife and a vacuum sealer and you’re well on your way. My daughter just took up hunting this fall and got a cow elk last week. She took the cooled and hung carcass into a local butcher/abattoir for cutting as she was not prepared for the extra work this year. She had an accurate weight of the carcass and asked for standard cuts. She ended up with 51% recovery. Is there a rule of thumb for what gets into the freezer from a hanging weight? Bill: Nope. It all depends on what you use and how you process it. Do you ever reuse your vacuum sealer bags? If yes, with any success?